Osmosis is a naturally occurring function. If a membrance is placed between dirty water and clean water, the clean water naturally migrates through the membrane to the dirty water. Reverse Osmosis is the process where, under pressure, dirty water is forced through a membrane to join the clear water, thus purifying it. All Reverse Osmosis Water Purification systems depend upon one form or other of a semi-permeable membrane. The membrane does not act precisely as a filter, because passage through the membrane is not entirely a function of physical size. Instead movement across the membrane depends upon the specific bonding characteristics of each module. Water and gases such as oxygen have the ability to make and break the binds necessary to move the molecule structure of the membrane. The system provides a self-cleaning mechanism for the membrane. The reject water is used to 'backwash' the membrane and it carries away the bacteria and other pollutants that don't pass through the membrane. The system is effective against most pollutants, and also removes a significant amount of bacteria. By using a conductivity test (as shown above), we can expose which waters have higher TDS in them. 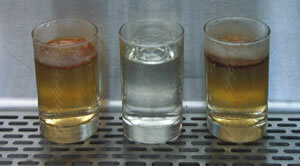 Tap water has between 100 and 300 parts per million (ppm) of TDS. Nepean Valley Pure Water has 0.02 ppm.